The judge leading the investigation into media ethics in the wake of the phone hacking scandal is poised to quit following a public attack on the probe by the Education Secretary. Lord Justice Leveson complained to Downing Street's most powerful civil servant about claims made by Michael Gove that the inquiry had created a 'chilling atmosphere' towards freedom of Press, according to the Mail on Sunday. In a telephone call with Cabinet Secretary Sir Jeremy Heywood he called for the Tory to be "gagged" and warned the inquiry was being undermined, it said. Sir Jeremy is reported to have told Prime Minister David Cameron about the conversation. "Our clear impression was that he was spitting tacks with Gove and was ready to resign unless the Minister was told to shut up," a Government source told the newspaper. Mr Gove, a former journalist at the News Corporation-owned Times, told a Parliamentary Press Gallery lunch in February that he saw "dangers" in the inquiry into press cultures, practices and ethics. Lord Justice Leveson instructed his officials to compile a full report of the comments and he phoned Sir Jeremy within 24 hours, it was reported. Called to give evidence at the inquiry last month, the Conservative Cabinet Minister went on to make an even more robust assessment about the potential outcome of the probe, warning the judge that inquiry recommendations were often "applied in a way that the cure is worse than the disease". The pair then clashed when Mr Gove raised concerns about restraints on the "precious liberty" of freedom of speech. In an apparent slap down, Lord Justice Leveson said: "I do not need to be told about the importance of freedom of speech, I really don't." Earlier this week he opened the hearings by warning it was "essential" cross-party political support for his investigation was "not jeopardised". 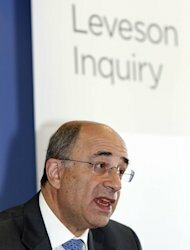 A Leveson Inquiry spokesman said: "Lord Justice Leveson is conducting a judicial inquiry and, in that capacity, will not comment on press stories outside the formal proceedings of the inquiry." Downing Street, the Cabinet Office and Mr Gove's spokesman all refused to comment.